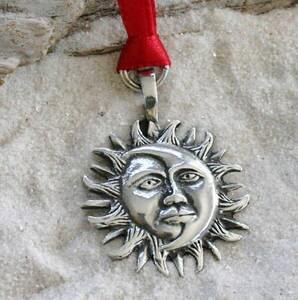 Style Ornament Keychain 16" Leather Necklace 18" Leather Necklace 24" Leather Necklace Cotton Cord 16"- 30"
This magical Sun and Moon Face Ornament is handcast and hand-finished in solid American Pewter with a shiny finish resembling antiqued sterling silver. This unique Holiday Ornament comes with a Red Satin Ribbon ready to hang from your Christmas Tree or as a Holiday Decoration for your home. They also make terrific gifts...you and your loved ones can enjoy this lovely keepsake for years to come! Length including loop: 1 3/4"
All of our pewter is lead free, nickel free and cadmium free...Made in the USA! The Moon is a universal symbol for Change and Power. Controlling tides…cycling phases…transforming nature…the Moon has held an important position in every culture for centuries. Symbolizing many Goddesses and many other powers, worship of the Moon has been common practice since the beginning of time.